Here is a sampling of some of my work. 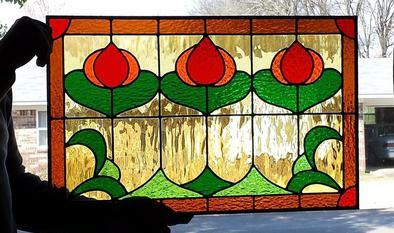 Panels that can be hung in a window. They are suspended by a chain so it is not a permanent installation. Easy to put in place. Repaired large sidelight that had substancial damage. Almost like new again and ready to be reinstalled. Panel ready for framing and installation into a new house. Panels on a scenic pergola in Paris AR. A transom panel with house number to be mounted above the front door of an older house. These also make attractive displays hung on your front porch. Panel on the left is ready for framing and installation into a new house. The one on the right is a bathroom panel already installed. 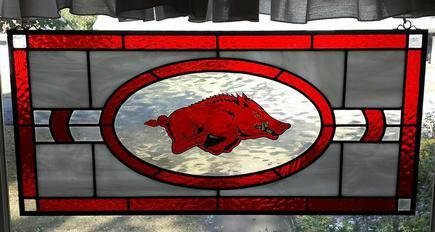 I work with WeatherBarr in Fort Smith and they frame my panels with protective glass on both the inside and outside of the stained glass. Call Andy Smith of WeatherBarr at 479-646-7891. Small window panel with an art deco design to be hung in a window. Restored church window with protective glass on the outside. 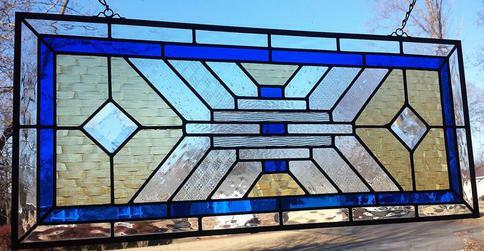 An art deco panel that is hung in a kitchen window. Window panel with clear textures and bevels. Prairie style panel that is assembled and ready for soldering. Prairie style panel framed, insulated, and installed in a bathroom. Round panel in a stand for an end table. Pergola with 3 stained glass panels for decoration and additional shade. Close up of the center decorative panel for a pergola. Here are a couple of kitchen cabinet panels ready to be installed. They will create a great focal point and interest in the room. 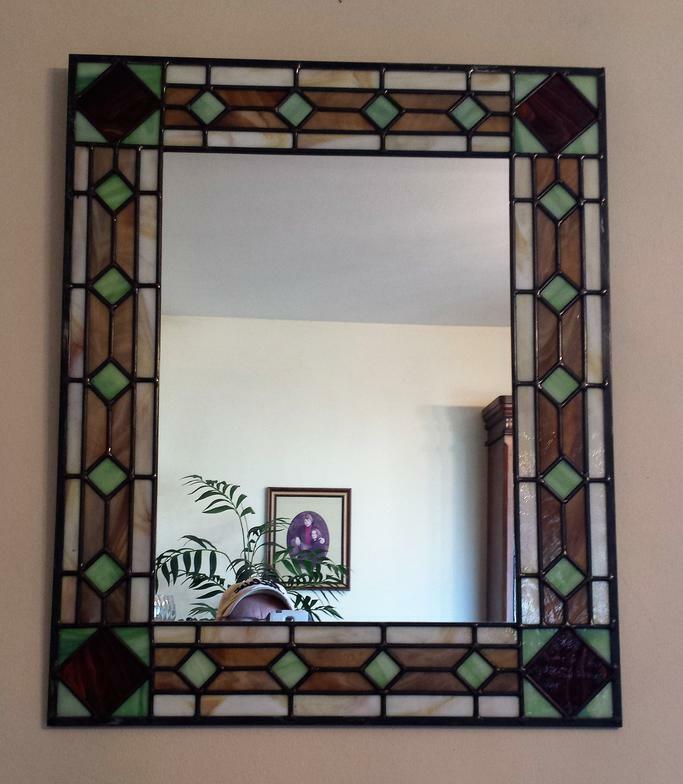 Wall mirror with stained glass border. 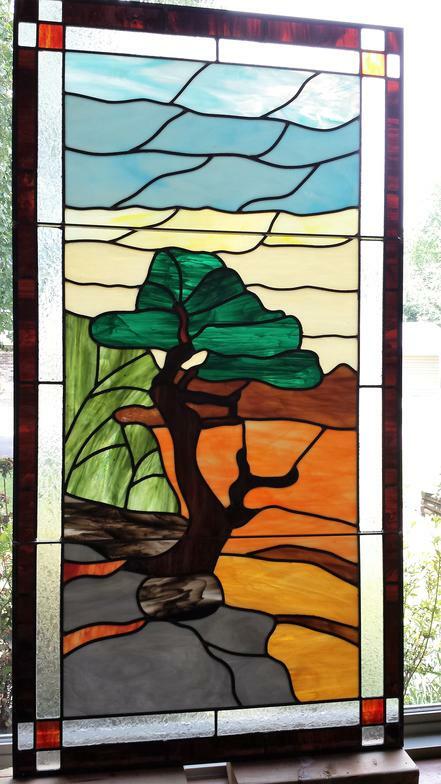 This panel represents the old cedar tree on top of Mount Magazine. It is going into a door of a new house construction. Here is a prairie style panel being installed in the bathroom of a new house construction. 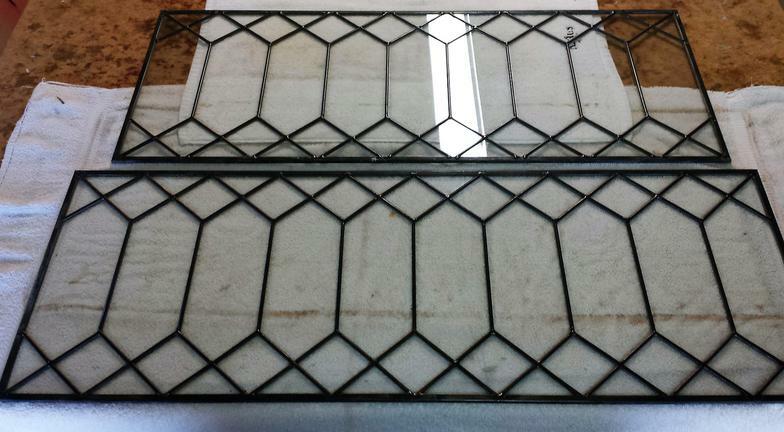 Very traditional leaded glass going into transoms of a new house. 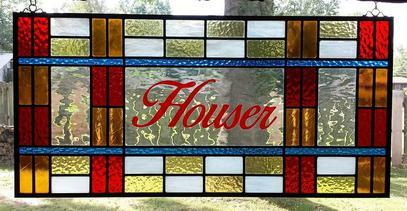 Window panels with last names can make for a long lasting heirloom and are great presents. 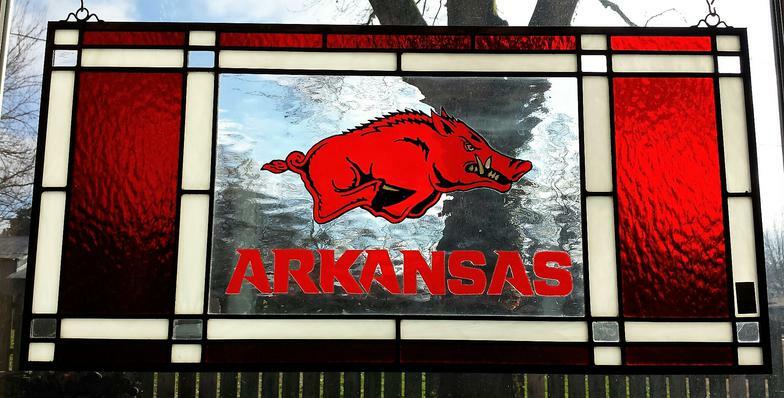 We are officially licensed by the U of A to use the Razorback logos in our artwork. 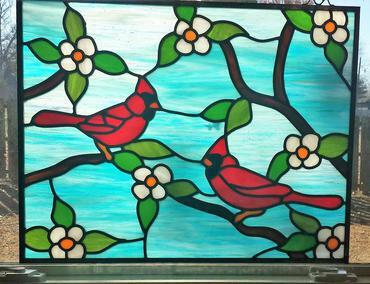 These are hand painted on waterglass and surrounded by stained glass. Available in many designs and sizes.